Visual phototransduction, neurons depolarization when no light: why? While reading into visual phototransduction I was surprised to learn that photoreceptor cells are actually depolarized when there is NO excitation (no light, i.e. when you see nothing, black) and hyperpolarized when there is light (I expected the opposite). Let the collection of neurons located within the eye be referred-to as IEN (inside-eye neurons) and, similarly, the collection of neurons directly linked to the eye, yet external to it be referred-to as OEN (outside-eye neurons). Let the collection of neurons directly getting input from the retina be referred-to as RN (retinal neurons). I'm assuming RN < IEN (subset of - correct me if I'm meaningfully-wrong). And finally, let the collection of neurons that directly link to OENs but are part of IEN be referred-to as XN (eXporter-neurons, in the sense that they export visual information from the eye to the "listeners" outside of it). So the path of visual stimulus would then be RN -> [...] -> XN -> OEN. Now, if my eyes were to be completely popped-out I'm assuming that relative to OENs that would have the same effect as XNs not passing along any excitatory/inhibitory information at all. Also, since what I'd perceive would be pure black, that seems to imply that XNs also don't get activated at all when we actually see black (e.g. close our eyes in a very dark room). So, when we perceive black => RNs get depolarized => they release glutamate continuously => XNs don't excite/inhibit OENs at all (seems to also imply that RNs don't intersect XNs). It is this inversion that intrigues me - why is it that for XNs to transmit NO information RNs have to continuously be excited? By that sense, this makes me think of the eye as if it was a big NOT gate. The reason for the depolarized state of photoreceptors in the dark is unknown as far as I know. It probably has its roots deep in the evolution of the eye. Indeed, photoreceptors are continuously active in the dark. A steady current flows through open channels (mainly Na+ ions). This current is called the dark current and it partially depolarizes the photoreceptor cell. The depolarized photoreceptor releases neurotransmitter (glutamate) to secondary neurons. Upon illumination of the photoreceptors rhodopsin molecules are isomerized to the active form and the photoreceptor cascade (Fig. 1) is initiated. 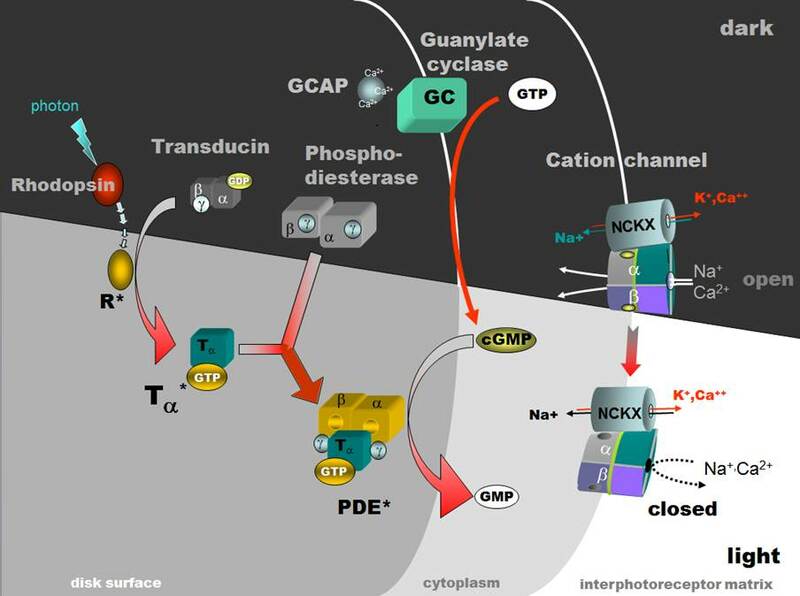 This ultimately closes the cation channels in the photoreceptor's membrane, stopping the dark current. This leads to cell membrane hyperpolarization and inhibition of glutamate release to the second-order neuron (Fig. 1). Admittedly, I do not know why phototransduction exactly is organized this way. There is a lot known about the evolutin of phototransduction (e.g., Lamb et al., 2016), but why the dark current exists is unknown as far as I know. I surmise it is probably an evolutionary relic. Evolution eventually has to work with pre-exisiting features to generate new structures, or alter them. Simple photosensitive spots evolved into the complex eyes observed in today's vertebrates. Evolution thereby used what was there and that happened to be an energetically unfavorable 'NOT' gate. Not the answer you're looking for? Browse other questions tagged neuroscience neurophysiology vision human-eye or ask your own question. Why can't the human eye focus blue light? Can one eye affect the other eye's low-light adaption? Why can't we see in low light if staring long enough? What is the connectivity between on-center & off-center bipolar cells? Do humans squint more readily at green light? Why do we see black when we close our eyelids? Why does closing one eye in bright light allow me to open the other? Why bipolar neurons in retina transfer information via graded potentials?